Fat is notoriously stubborn. We can’t pick and choose how our bellies, hips, or thighs store fat—and even those of us who work hard to keep slim are often bothered by a pocket of fat gathered in one area. If you’re tired of fighting with fat that just won’t go away, CoolSculpting® can help, without surgery, needles, or downtime. Why consider CoolSculpting to reduce fat? We’ve made CoolSculpting better with Z Wave. Here’s how. On it’s own, CoolSculpting works great. When followed up by the Zimmer Z Wave treatment, it works even better. The Z Wave is a non-invasive, painless treatment that uses radial pulse therapy (brief blasts of sonic energy) to stimulate collagen production, break up fibrous tissue beneath the skin, and reduce the appearance of cellulite. When performed immediately after CoolSculpting, Z Wave treatment has been shown to reduce post-treatment swelling, firm and smooth the skin in the treated area, and increase overall fat reduction. The difference is real—that’s why we include a complimentary Z Wave treatment after every CoolSculpting session: it’s the Granite Bay CoolWave. 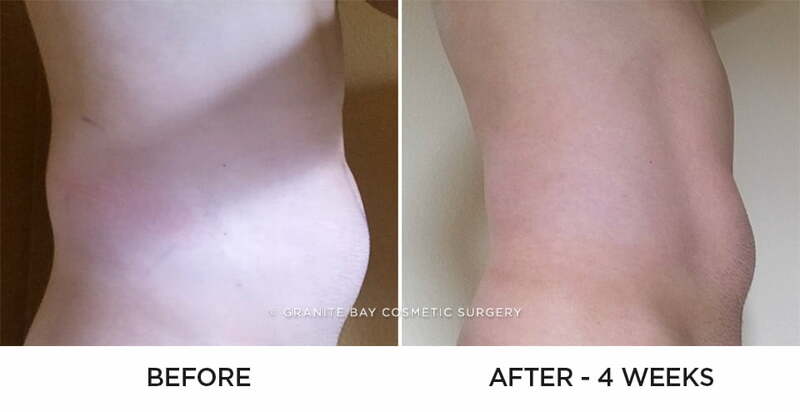 Contact us today to request a CoolSculpting consultation at Granite Bay Cosmetic Surgery. After CoolSculpting, you’ll notice your “problem area” shrinking within just few weeks. Our technicians perform CoolSculpting during an office visit at our state-of-the-art facility in Granite Bay. You don’t have to do anything special beforehand; just show up. We’ll start by applying a gel pad to the treatment area and placing the CoolSculpting device, which pulls the skin and fat up into the applicator. You’ll feel a strong suction that can be uncomfortable for a few minutes, followed by intense cold. Usually these sensations ebb quickly and the area feels numb for the remainder of treatment. Immediately after CoolSculpting is done, we’ll begin the Z Wave treatment. A handheld device is pressed onto the skin, where the Z Wave delivers brief pulses of energy deep beneath the skin. It’s noisy, but there’s no discomfort, and it takes just a few minutes to complete. After CoolSculpting, you may have some mild swelling, redness, and bruising or a tingling sensation, but it’s safe to go right back to your normal routine. Results start to appear after a few weeks, as the fat cells die off and your body metabolizes them naturally. CoolSculpting gets results after your first treatment, and even better results with two! CoolSculpting is a great alternative to liposuction for the patient who’s generally happy with his or her shape but needs a little help reducing smaller pockets of fat. It’s not a replacement for liposuction, which can reshape an area and remove fat from multiple locations in one procedure. We’ll help you weigh the pros and cons for your needs at your consultation. Have questions? Ready to try the Granite Bay CoolWave treatment? Give us a shout! Call 916.242.2662 or use the form below.